I have been researching the history of immigration in the East End with a view to finding texts which direct me towards possible images for this project. This rather turns my normal approach upside down – I usually make the photographs and then think about the captions. I am not simply looking for captions in fact. Rather I want to offer the texts as an additional stream of information to accompany the visual data offered by the photographs. I want to open up new readings of my photographs not to anchor them down. This is not an easy task and I will need to give very careful thought to the texts I use. My overall intention is to document how immigration has shaped London’s East End and within this I hope to be able to open up the minds of viewers to the challenges and struggles of immigrants face. And there are many challenges – finding somewhere to live, learning a new language, finding a way to make a living, getting to grips with a new culture, overcoming racial prejudices and violence and lots of hard work and struggles along the way. Once established most immigrant families become integrated into the community and many move on, making room for newcomers. 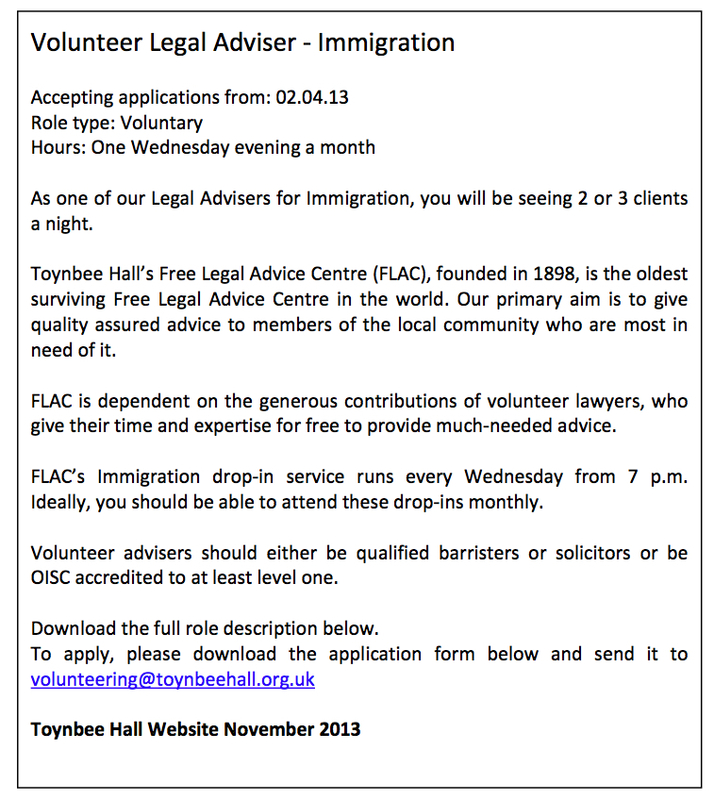 Immigration in the East End has occurred as a succession of waves. I set out some image/text combinations in my previous post here and here. To be honest I am happier with the texts for these combinations than I am with the photographs – much more work to be done!! 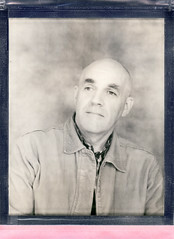 I have set out below a number of further texts alongside a description of the photographs I have in mind. I am doing this to chart my progress as I go along and to keep track of what I am doing….The texts may change, the photographs may prove to be uninspiring, things will change…. Many early immigrants were sailors who were effectively stranded in Britain because of the dictats of the Navigation Acts which called for ships leaving Britain to be crewed by British sailors. Left homeless in a strange country, many stranded sailors died. Eventually philanthropists stepped in to help alleviate the suffering. ‘Stranger’s Home for Asiatics, Africans and South Sea Islanders’ was a hostel for stranded sailors. It was located on West India Dock Road. The site is now a block of flats built to a Modernist design in 1946. I plan to picture the flats as the site of the former ‘Strangers Home’. With luck I will be able to make a photograph of the place with the sun rising (in the east) behind it. 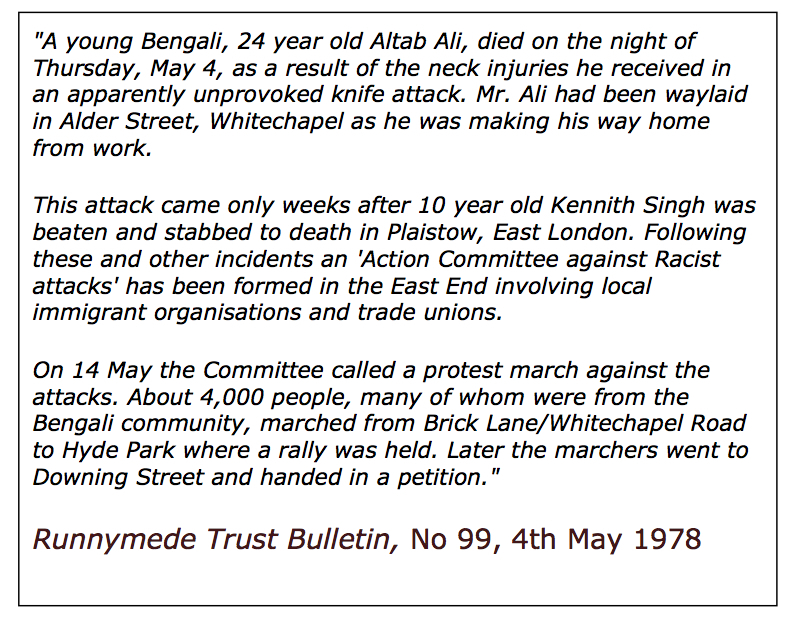 In May 1978 a young Bengali Altab Ali was murdered by a bunch of racially motivated youths on Alder Street just off thee Whitechapel Road. The location is now a park which is named after Ali. It is a place of remembrance. I wish I could believe that racial violence is behind us but I doubt this is the case. I hope to be able to produce a ‘beautiful’ image of the park which will contrast sharply with the violence which resulted in its creation. 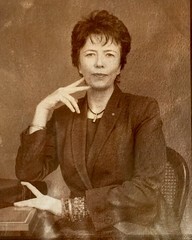 This text will accompany the photograph. In the early part of the 20th century the Synagogues were the principle houses of worship in the part of the East End around Spitalfields. 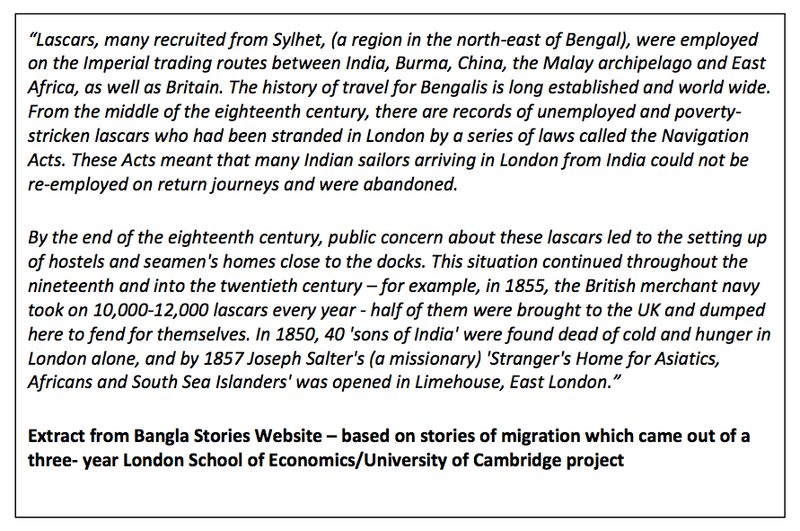 Now many have been closed and replaced by Mosques as the successive wave of Bengali immigrants have become established. 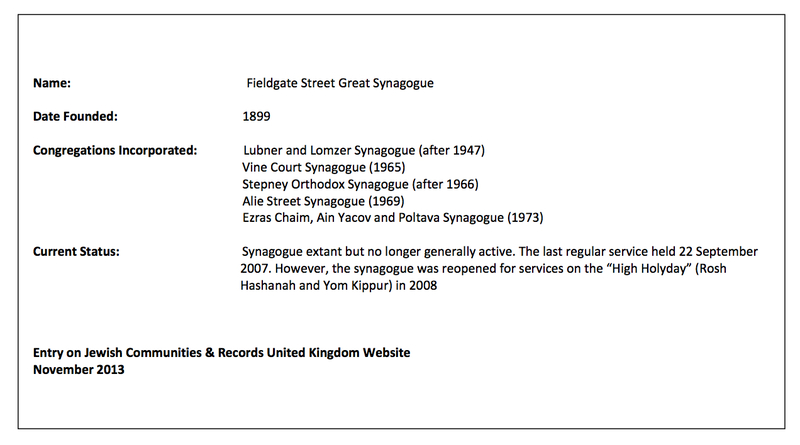 Fieldgate Street Synagogue is for the most part closed. It is surrounded on three sides by the towering new buildings of the East London Mosque. I want to use this as a metaphor for the idea that immigration is a process of integration and moving on. I want to find a way to photograph this Synagogue – it won’t be easy as the location is not photo-friendly. If I am successful i will accompany the photograph with this text from the register of Jewish Communities & Records Website. I have a number of other potential photographic sites in mind for which I have yet to find texts. So I will add to this post and update my thinking as I go along. I was only thinking yesterday about the difference between the text informing the photograph and vice versa. 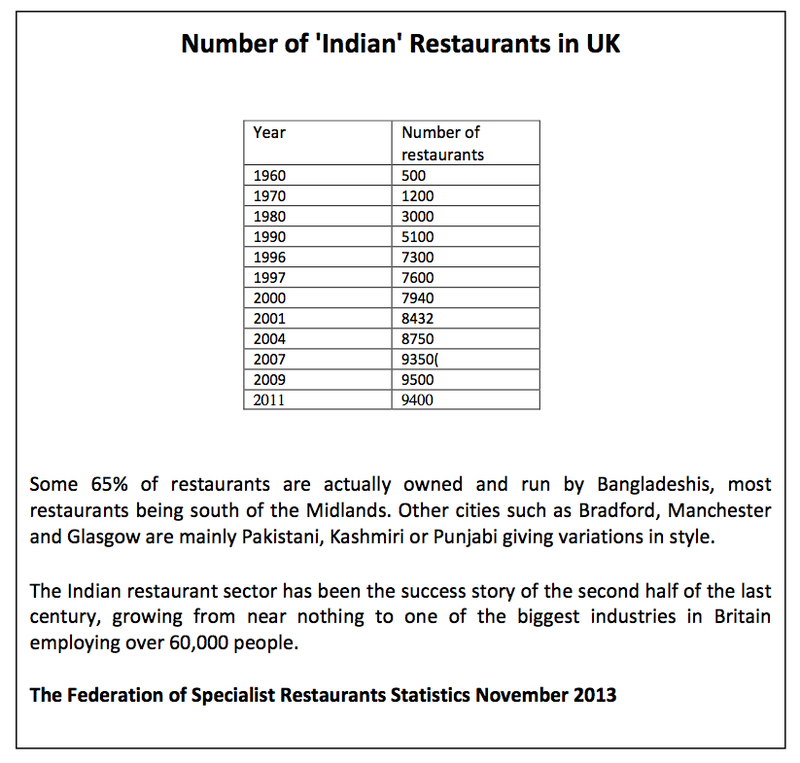 Interesting reading the information as it got me to wondering when I first had a curry. Why did a Chinese restaurant come into mind as I thought back to the early 1960s? Checked with my husband and he said the same thing so maybe it was – actually it’s becoming clearer; I remember going down steep stairs into the Chinese restaurant below (in Sheffield) and having this dish called ‘curry’! I was wondering as well about early newspaper accounts similar to the 1978 one you include. Could even earlier ones also illustrate the events you refer to; would that make any difference to the way that viewers read your images. Good point Catherine…on re-reading the texts some seem too obvious…but the photographic subjects remain valid…I will need to think very carefully about the texts…they need to be linked to the subject but not close down the reading nor offering simple explanations….For example on the Altab Ali park image, perhaps a list of the names of Bengalis murdered over the last 40 years might be a better route…lots ot think about.